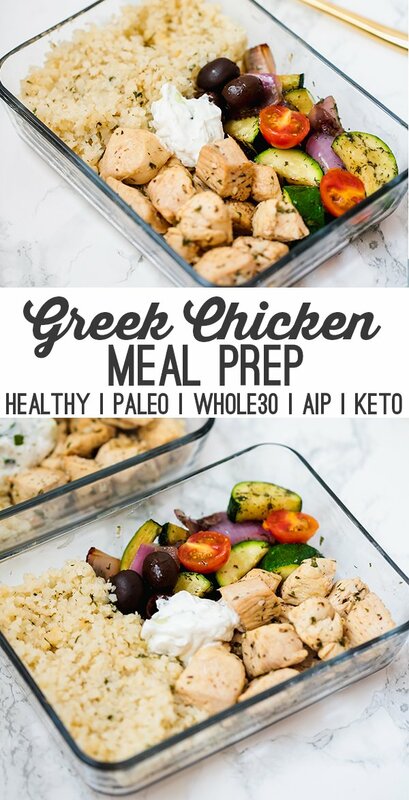 This one-pan greek chicken is the perfect dish for healthy meal prep! It’s full of veggies, healthy protein, and features a dairy-free tzatziki. It’s paleo, Whole30 compliant, and AIP with modifications. When I was first diagnosed with Hashimoto’s, I tried to commit to a healthier lifestyle that I just couldn’t stick to. Time, temptation, and lack of motivation always got in the way. Though there were several factors that came into play to finally make a healthy lifestyle sustainable for me, meal prep was a big part of it! It’s made in one pan! Yup! You can make this all in one pan. Of course, you could split it up into more than one, but you don’t necessarily have to. Healthy fats, tons of veggies, fresh herbs, and a satiating protein. What more could you ask for?? You can also use chicken thigh in this dish. Use a food processor to rice your own, or use pre-riced cauliflower. These are the veggies that make up the dish. I had my portion without the grape tomatoes, so you can easily sub those out for AIP. 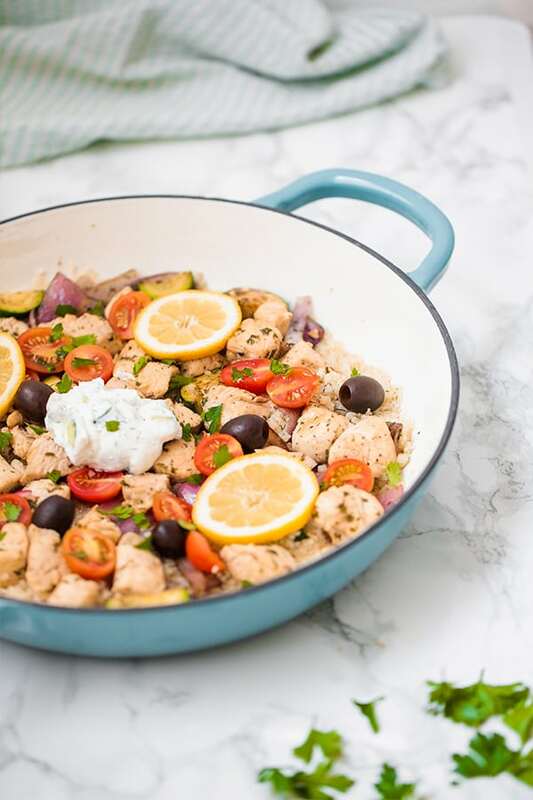 If you don’t like olives (apparently they’re a controversial food) you can leave them out, but if you love them like me, they go great with this dish! This is what you’ll need for the homemade tzatziki. I recommend a coconut yogurt brand like coyo that has minimal ingredients. Pre-priced cauliflower is so easy to find these days. You can find it at Sprouts, Trader Joe’s, Whole Foods, Target, and more. It’s my favorite convenience food! Can’t find a good quality yogurt in your area or don’t want to make your own? No problem. The tzatziki is optional and the dish still tastes great without it. You want to keep the tzatziki cold, so don’t store it with the rest of the dish that you’ll reheat. Using a large skillet, heat avocado oil over medium heat. Stir in the chicken breast and season with about 1/2 tsp of salt and lemon juice. Saute until cooked through to 165 F internal temperature and set aside. Saute the zucchini and red onion in the pan for 4-5 minutes or until cooked to liking. Add more oil as needed. Set aside. Add 1 tbsp of oil to the heated pan and saute the cauliflower rice for 5 minutes, or until lightly browned. Stir back in the chicken, zucchini, and red onion and season with parsley, dill, garlic, and extra salt and lemon juice to taste. Saute for 2-3 minutes to reheat and incorporate the flavors. Top the skillet with sliced lemons, black olives, and sliced grape tomatoes if desired. 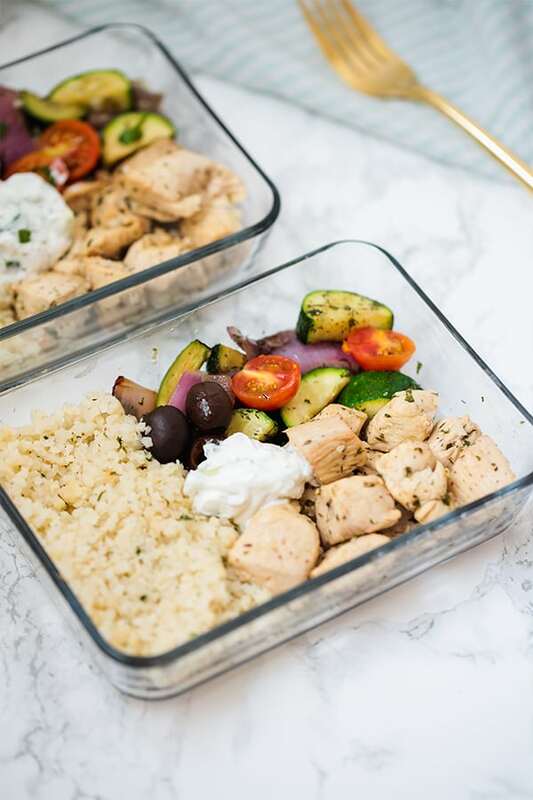 Store in 3-4 glass Tupperware containers (like this) with the tzatziki on the side. Store the tzatkiki separately to keep it fresh. This looks Delicious! I’ll have to make this sometime soon. Is the teal pan a ceramic coated cast iron? I’ve been looking something like that for a while. How would you reheat this meal – I think it would work for a meal ministry, so would need to leave with instructions. Reheating it in a pan on the stove top for a few minutes should do the trick! 🙂 Thank you for what you do!! 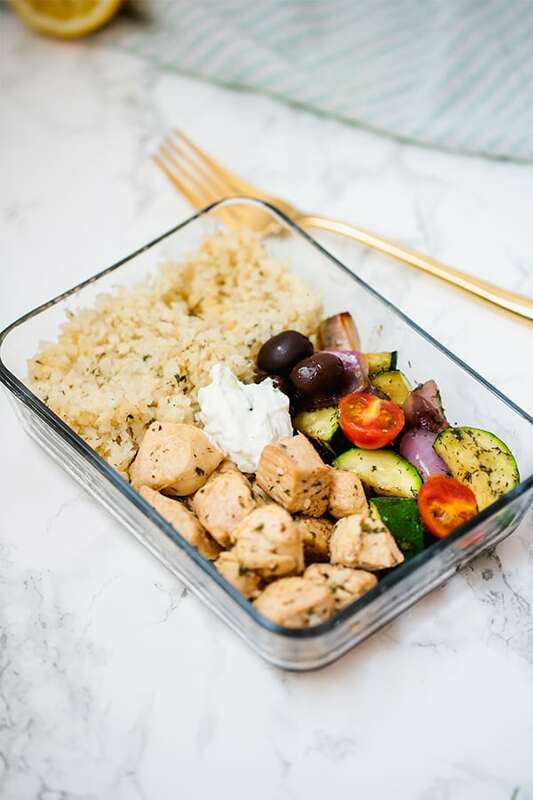 This meal is so tasty and I love the fact that it has so many added veggies packed inside, as well. Another fave! Recipe was SO good! Made it as is and its a repeater for sure! I saw the nutrition contents is it 446 calories for 3 servings? Or 3 oz…not sure.